These Aha! resources are also available in Spanish! You know those smells that are instantly recognizable? Smells like fresh-cut grass, lemon, mint, and wet pavement? They’re the kind of smells that are unique enough that most people who smell them can immediately identify their source. All of those smells are made of molecules! Molecules are groups of two or more atoms bonded together. All of the matter on our planet is made of atoms, and most of those atoms are bound up with other atoms into molecules. While some molecules are odorless (like water, or H2O; baking soda, or NaHCO3; and carbon monoxide, or CO), others are what give roses, pizza, and even people their unique odors. Fill the pot with an inch of water, and put your nice-smelling thing in the pot. Place the mason jar upright in the center of the pot. With the help of an adult, set the pot on the stove, and turn the burner to medium-low. Put the pot lid on the pot upside down. Fill the lid with two cups of ice. Bring the pot to a simmer, and simmer for 5–10 minutes. Turn off the heat, and use oven mitts to carefully remove the lid and melted ice cubes. Use tongs to take the mason jar out of the pot and set it on a hot pad, being careful to preserve the liquid inside. Let the liquid cool, then smell! When you smell the liquid, how similar does it smell to the scent that you were trying to capture in the first place? Are there any parts of the smell that are missing or different? 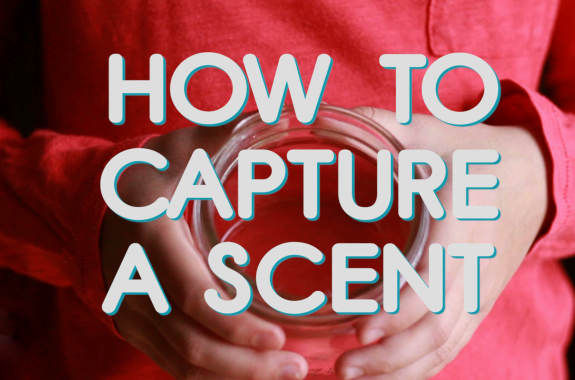 Let someone else smell your captured scent. Can they recognize the scent without you telling them where it came from? Carefully remove some of the nice-smelling material that you placed in the pot initially, and pat it dry with a paper towel. What does that material smell like now? Using a spoon or baster, carefully take out some of the water that is in the bottom of the pot and put it in a separate container. Compare the smell of that sample with the liquid that you collected in your jar. Do they smell the same or different? Is one stronger than the other? Which sample smells more like the scent that you were trying to capture? How do you think that the scent got into the jar? Describe the path that the scent took to get into the jar, indicating whether you think the scent was in a solid, liquid, or gaseous phase at each stage. Why do you think that some of the original scent is still in the original material, while some of it is detectable in the water in the pot? Aha! You’ve separated molecules by vaporization! In order for a scent to travel through the air into your nose, scent molecules must be in a gaseous state. Converting a solid or liquid into a gas, or vapor, requires heat, which causes molecules to break free from the substance into the surrounding air. The amount of heat required to convert a substance from a liquid to a gaseous state is called the heat of vaporization, and it varies widely from substance to substance. (Technically, the heat required to convert a solid to a gas is the heat of sublimation, but for simplicity’s sake, we’re just going to use vaporization.) When you gradually heat a material that contains many different scent molecules, the molecules with a low heat of vaporization will turn into gases before the molecules with a high heat of vaporization do. Molecules that require hardly any heat to become vapor are called volatile molecules. As it turns out, most of the scents that we know and recognize are mixtures of volatile molecules. Their high volatility is how they get inside our noses! Some molecules can even become volatile at room temperature. Take a rose, for instance. You don’t have to physically stuff petals up your nose in order to smell them because rose-scented molecules travel into your nose as gases. Meanwhile, the less-volatile molecules in your nice-smelling material got warm and wet, but they didn’t vaporize. That’s why your material still had a scent, even after heating. Experiment more, make predictions. It’s what scientists do. Ask questions: Were there any particular scents that you weren’t able to capture in your mason jar? Were there any scents that seemed to stay in the water at the bottom of the pot? Modify the experiment: Try replicating the experiment, but this time, take samples out of the mason jar with a teaspoon or baster every minute as the pot heats up (and be careful to use hot pads when you remove the lid). Do the samples smell different from one another? Why do you think it might matter how long you heat the liquid? What does this tell you about the complexity of the scent that you are collecting? Are there any substances that don’t seem to have scents that can be captured? Document your experimental results: Describe as best as you can how the scents that you periodically collect differ from one another, and how they differ from the original scented material. How did the smell of the liquid that you collected in your jar change over the course of the experiment? Tell other people: Teach other people what you learned! Aha! by Science Friday, is a series of short science experiments that you can do in 15 minutes or less, with materials you can find at home. Ariel Zych is Science Friday’s education director. She is a former teacher and scientist who spends her free time making food, watching arthropods, and being outside. how can we preserve that smell into a jar for 30 days or more..? Is there any chemical way to store them.as like we store perfume fragrance for a long in a bottle. How can I put that scent on a piece of fabric so it stays there forever, even after washing? You know like how the smell of Tabasco stays on peoples clothes but instead with essential oils or something. A nonprofit in Los Angeles opens the door on the secretive world of perfuming.